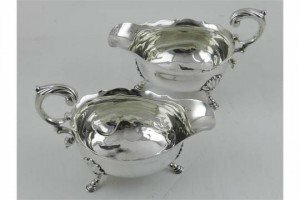 A pair of George II silver gravy boats, with scalloped rims, sitting on three shell mounted stepped hoof feet, hallmarked London 1753. 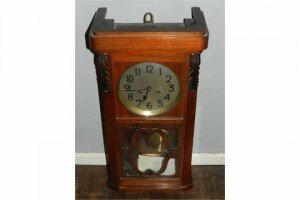 A mid 20th century German mahogany wall clock, the silvered Arabic dial with outer minute track, eight day movement, chiming gong. 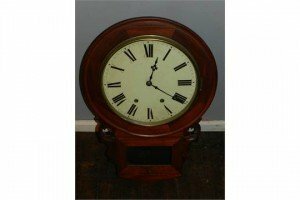 An early 20th century mahogany drop dial wall clock, the painted Roman dial with outer minute track, eight day movement, chiming gong. 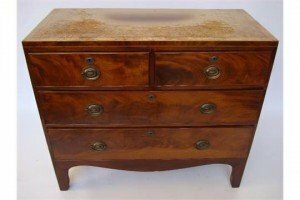 An early 19th Century mahogany chest of drawers, with two short and two graduated long drawers, on bracket feet. 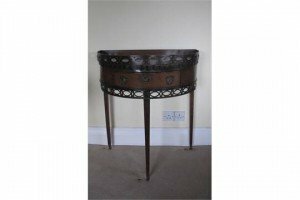 A demi lune oak occasional table, with pierced gallery & apron, frieze drawer raised on slender tapering supports. 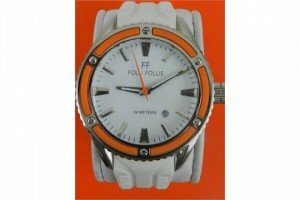 A Folli Follie stainless steel wristwatch, the enamelled dial with baton markers and date aperture, rubberised bezel. 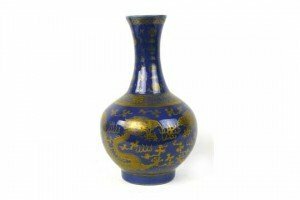 A late 19th/early 20th century Chinese bottle vase, the blue ground gilt decorated with a pair of dragons, bearing a six character Guangxu mark to the base. 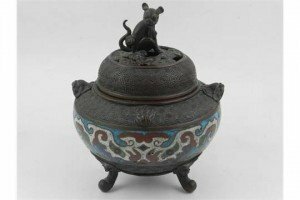 An early 20th century Japanese bronze and cloisonné koro and cover, with dog of Fo finial, sitting on three splayed feet. 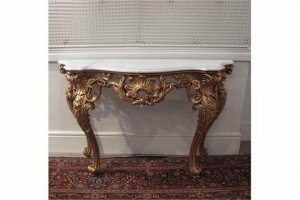 A Victorian style giltwood console table, the serpentine grey veined marble top on carved and pierced frieze & cabriole supports. 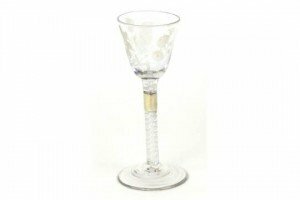 An 18th century etched glass cordial glass, the air twist stem mounted by a white metal ferrule. 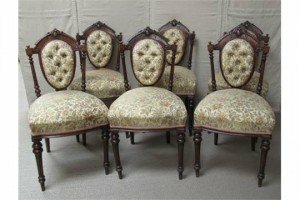 A set of six Victorian walnut salon chairs with upholstered backs and seats raised on turned tapered supports. 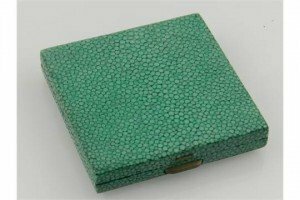 A shagreen style and metal compact, having internal mirror and powder compartment. 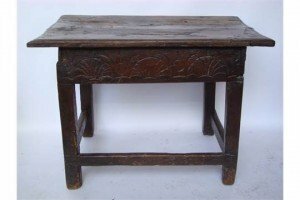 A 17th Century and later oak table, the two plank top with moulded edge above a frieze carved with lunettes, on square supports united by back and side stretchers. 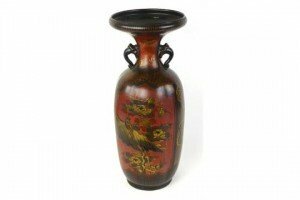 A Meiji period Japanese red and black lacquered vase, relief decorated with birds upon a treetop. 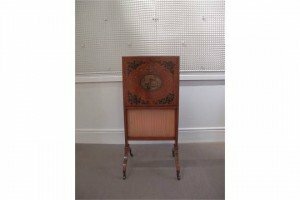 An Edwardian painted satinwood fire screen, raised on splayed supports terminating in brass castors. 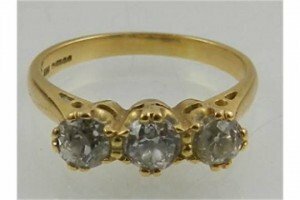 An 18 carat yellow gold and three stone diamond ring, the round cut stones of approx. 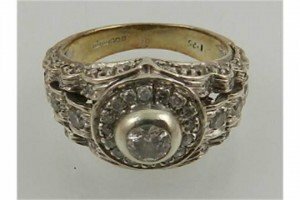 0.60 carats combined. 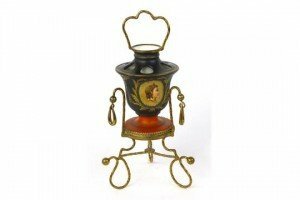 A Napoleon III porcelain inkwell, the background decorated with a head and shoulders portrait of a young woman, on a gilt metal stand of scrolled form. 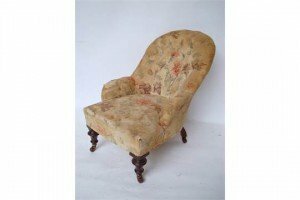 A Victorian walnut button back upholstered low easy armchair, on turned forelegs and brass casters. 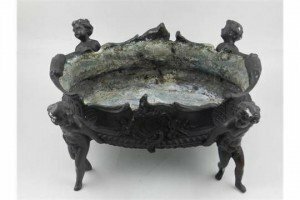 An oval bronze table jardiniere, of oval form in a Rococo decoration raised on four putti supports.